Unlike European countries, the United States doesn't have a central national depository of vital records - birth, marriage and death certificates. For these you have to search by state and often at a county level, which creates a number of problems in genealogy. It can be difficult tracing a family history, certainly in a family that migrated west. You need to know where the event happened to be able to find it, which at times can involve guesswork as part of a genealogy search and poring through plenty of records, especially as there was no real registration of births, marriages or deaths before the start of the 20th century, meaning precious few birth certificate, marriage certificates and death certificates. However, the certificates are important, not so much for noting the event itself, but for what else they can reveal in genealogy. 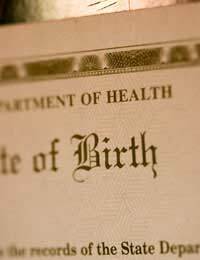 Birth certificates will usually contain the full names of both parents and American marriage certificates often record not only the names of the bride and groom's parents, but also where they were born - an important clue to further your family history. If you're beginning in genealogy and want to trace birth certificates, marriage certificates or death certificates, a good place to access the records you'll need is through the National Centre for Health Statistics, which offers links to the records offices in different states. From there you can hopefully find what you need and contact the appropriate office to obtain a copy of the certificate. In some cases, the State Records office might have a database that can be searched online; in other instances you might need to search in person, or submit a request for a search of the records. Inevitably, you'll have to pay for a copy of the certificate you're requesting and the fees will vary from state to state, so going back a number of generations can become expensive. Obviously, the more information you can give when you're requesting a search for a certificate, the better in your genealogy search. Ideally, a records office would want to know not only the date of the event, but also where it happened, down to county or town, if you have that information. Of course, in genealogy that's often not possible, but supply as much as you can (with births, the mother's maiden name can be useful too) and be sure to state why you're looking for the records and what your relationship is to the person you're investigating to show a family history. It's also helpful to include your phone number, so the office can contact you if necessary. For a number of reasons, the state can't promise to be able to supply the certificate and as most don't have staff working solely to fulfill family history requests, patience is essential. We don't generally think of divorce papers as so-called "vital records," but in many ways they are and America has been a society where divorce has been commonplace for much of its history, making them important in genealogy. Knowing of a divorce, for instance, can spur you to look for a second (or even third or more) marriage. Any terms in the divorce settlement - regarding children or property - can also help open up new avenues of for a genealogy search. As with the other vital records, you'll need to contact State Records office. They'll not only need the full names of both parties in the divorce, but if possible, the date and place of the divorce and the type of final decree, as well as why you're looking for the record. Once again, it's probably best to include your phone number, in case of problems. It is also worth remembering that since in many cases you won't be able to search indexes in person, you won't be able to work around such things as clerical errors and misspellings.